As I develop my art journaling practice, I find myself moving further and further away from what I see others call “art journaling”. So I began to think… perhaps what I’m doing is something different. Should I refer to it as visual journaling? What does that term even mean? What does “art journaling” even mean? How would you define “art journaling” and “visual journaling”? Does it really make a difference what it is? What’s your intention when coming to the page? Leave a comment below, and let’s continue the conversation! Special Thanks To: Hali Karla, Andrea Schroeder, Connie Solera, and Lisa Sonora for making this video possible! 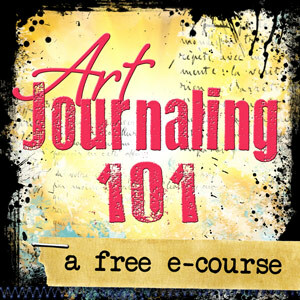 Want to learn more about art journaling? Oh my goodness! Did I ever enjoy this video! 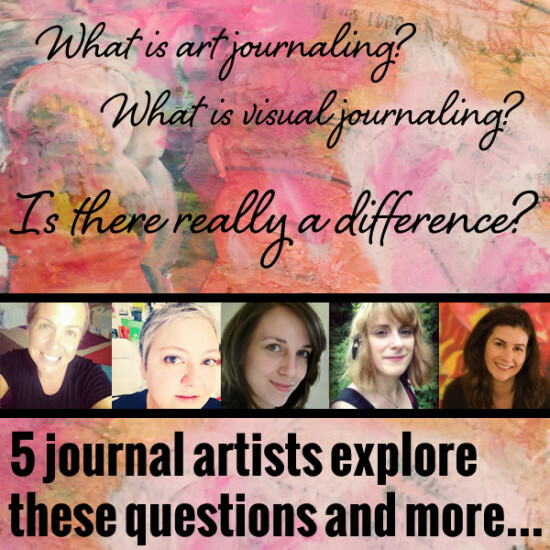 Thank you to all the artists who shared their thoughts on art journaling vs visual journaling and sketchbooks! Thanks so much for doing this video. I really like what one of you said about how calling it a “visual journal” rather than an art journal can help a person get over the hump of not identifying as an artist. Oh, this was wonderful to watch. It’s so interesting to hear the different thoughts and ideas of these women and to see their work. Lots of little pearls of wisdom and morsels on which to chew. Thanks so very much for producing this video. So interesting to hear all of you talking of your vision of a journal. Very inspiring. Thank you. All of you, thanks for making this video! Insightful and clarifying! Bravo!! At the end of the day it is all about who you are and what you want to express on a page. Thank you Krystal from the tips of my non-artistic fingers to the deepest depths of my very creative heart. Thank you to all the wonderful artists that contributed to this video. Seems like it was just what I needed to hear at this moment in time. Thank you Kristal for once again sharing a great video! Hi Kristol, I really enjoyed getting others views on this subject. I have kept what I call an illustrated journal since I was a teenager and I am 67 yrs old now so that has been a very looong time. Lol. This journal is private and is mostly writing, with doodles, drawings, pasted in pictures, etc, that kind of reflects my thoughts, moods, or events that occurred that day. This is pretty much a daily journal and is private. But a few months back I took your journaling 101 e-course and started what I call my “Art Journal”. This book is for play with different techniques and materials and has very few words. Maybe a quote or a single thought on the page. So I guess they are both an expression of me. I don’t think it matters what you call it. The only distinction between the two is that one is private and the other is not. Beautiful video Krista :) I love the way everybody expressed their own opinion about journaling, it encourages everybody else to do the same. Just beautiful! thanks again to all the awesome artist that made this video, love it!!! Thank you for this conversation. Art Journaling is such a wonderful and healing process whatever you want to call it. I highly recommend that everyone should try it. Besides being a healing process, it is just plain FUN! The online community of artists are so supportive and so creative. I happy to have discovered this after retiring from my career as an art therapist. This is such a meaningful adventure to be able to share and to be inspired by others online. Oops! No place to fix bloopers! I am happy! thank you so much Kristal for this wonderful video by my favorite artists. Interesting!! I wouldn’t have differentiated them before watching this. I’d have considered art/visual/creative journalling synonymous. I can understand how it is differentiated here, though. For me personally, they would both be personal because I’m working in both areas (re: the given descriptions of visual/art journals) with a very sacred part of myself. For instance, even if I’m painting my dog or a landscape, because it taps into a creative practice and a deeper listening as I work on the art, it always reflects an inner landscape. Especially since I always write afterwards, giving my artwork a voice. I think it’s all a valuable practice – no matter what you want to call it or how you want to differentiate it – it really doesn’t matter to me. But an entirely interesting discussion from other’s perspectives! That being said, I can look through art journalling magazines or tutorials online and note that it is more for *technique* and showing personal talent. :-D Though my talent has improved over the last couple years of my starting this process, it is all an inner journey given my outer world – and therefore not easily for show. Perhaps this can all be easily differentiated by intent. Product vs. Process. And for me, it’s all process. And I’d venture to say, even those with an intent to produce a showpiece, they have a bit of inner process going on too. The video was valuable and thought provoking. I loved the idea of art journaling in order to get clarity on something. I don’t share mine outside of my home. I do this creative process in order to have something inside me put out on paper. My pages are a joy to look back on and that makes the whole process worth doing. Thank you. OH thank you Kristal for doing this video!!! It came at the perfect time. I am 5 pages shy of completing my creative journal. I love looking at Art Journaling magazines and YouTube videos, but was very critical of the way my journal looked compared to theirs. I think I am attracted to mixed media art in general and those books were like a gallery. I realized that I was comparing my insides to their outsides. I don’t know how much practice they had to do to get to that point in their expression. I have always been more of a process person and creative journaling is perfect for my needs. I would like to get some artistic training so that I can make mixed media art and learn how to use the materials, but for now I can appreciate the work I put in my journal and the process of chronicaling my life! I see it as expressing visually what Is, what wants to be seen, heard, etc. with curiosity, benevolence and gratitude. thank you for this wonderful view into the world of journaling. It is a funny thing … even the word journaling is not viewed as correct spelling lol. So is it real true art work? yes !!!! I Believe that the work I journal is the most organic form of my art because the pressure is off! no one will ever see this work of mine so I am free to just be me. Thank you for this insight from the amazing women in this video! I will share your 18 minutes with my tribe so they may open to this freedom of making ART!!!!! feeling words!!!! loving or not the colors they create~marks that we make~and moods that flow from our hearts onto the paper. Kristal: I just found your web site today and I just have to tell you I LOVE IT! Wow! I just can’t wait to get into it deeper. I just watched the art journal vs the creative/visual journal and it was such an enlightening video, I am sure I will watch it again. Thank you so much for giving of yourself to all of us in need! Just lovin’ this!